As per the decision of Joint Convention of Joint Consultative Machinery of Central Government Employees (JCM constituents) held at New Delhi on 11.12.2014, a meeting of leaders of JCM constituent organizations in Bangalore was held on 12.1.15 and on 22.01.2015 at 17.30 hours at SWRMU office in order to form a Joint Action Committee for Karnataka State. Accordingly, The Joint Action Committee was formed South Western Railway Defence, Postal and Confederation of Central Government Employees & Workers as its members. Com. Amd Dcrouz, General Secretary of SWRMU of Railways & C.G. Employees, as its Convener and Com. S. Radhakrishna (COC), Com. 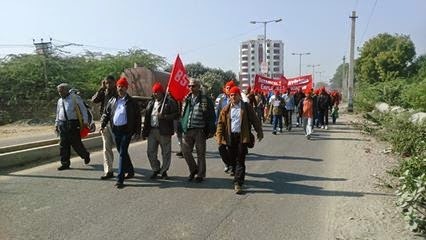 P. S. Prasad (COC) and Com. M. K. Ravindranan Pillai (AIDEF), Com. Thirumalai (AIDEF), Com Raghavendra (SWRMU), Com Jawarigowda (Postal), Com A. Srinivas (RMS) & Com Shivakumar (FNPO) as committee members. The Committee decided to form district level JCA committees a within fortnight. 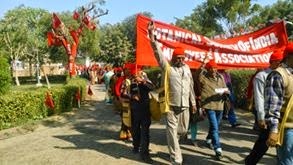 The Committee decided to call a Joint Convention on 10 charter of demands on 4.03.2015 at from 10 am to 3 pm hours at Railway grounds Banglaore in which 5000 delegates will attend the said convention It has been also decided to have Joint Conventions in major industrial towns all over Karnataka. The posters will be printed shortly and distributed to all offices including taluk level offices for state wide distribution. 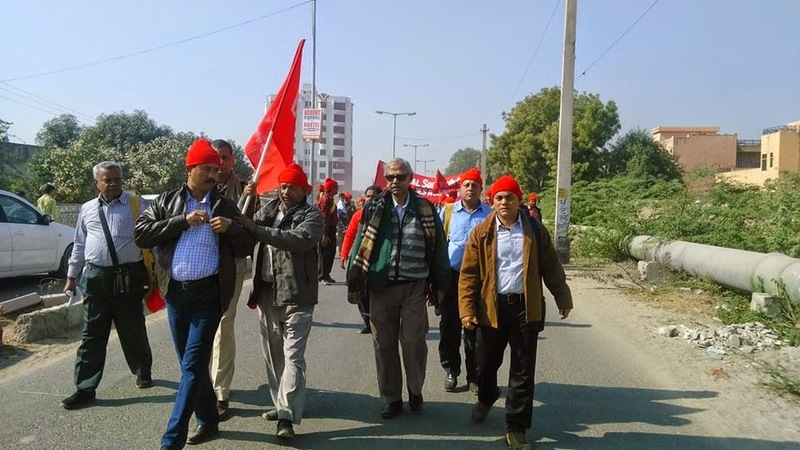 General Secretaries of all C-O-Cs of Confederation are requested to send reports of State level & District level convention and also all other activities in connection with proposed Parliament March and Indefinite strike of National Joint Council of Action. All the reports of State & District Committees will be published in the confederation website along with photos if any. As per the decision of Joint Convention of Joint Consultative Machinery of Central Government Employees (JCM constituents) held at New Delhi on 11.12.2014, a meeting of leaders of JCM constituent organizations in Mumbai was held in Jagdish Ajmera Sabhagruh, WREU Complex, Grant Road (West), Mumbai on 14.01.2015 at 15.30 hours in order to form a Joint Action Committee for Mumbai & Maharashtra State. Accordingly, The Joint Action Committee was formed consisting of 22 leaders from Western Railway, Central Railway, Defence, Naval Dockyard and Confederation of Central Government Employees & Workers with Postal, Income Tax, Atomic Energy. With Com. J.R. Bhosale, Leader of Railways & C.G. Employees, as its Convener and Com. R.P. Singh, Com. Pravin Bajpai and Com. Satyanarayan C.H. as Joint Conveners. The Committee decided to meet on 19.01.2015 at 16.00 hours in CRMS Office, CSTM, Mumbai. The Committee decided to call a Joint Convention on 23.02.2015 at 14.00 hours at CSTM Auditorium, Fourth Floor at Platform No.14, CST, Mumbai. It has been also decided to have Joint Conventions in major industrial towns all over Maharashtra and a grand rally in Azad Maidan in protest against Government’s retrograde policies adversely affecting workers and to achieve 10 Points Charter of demands. 2/44, Muthial Chetty Street, Purasawalkam, Chennai – 600 007. 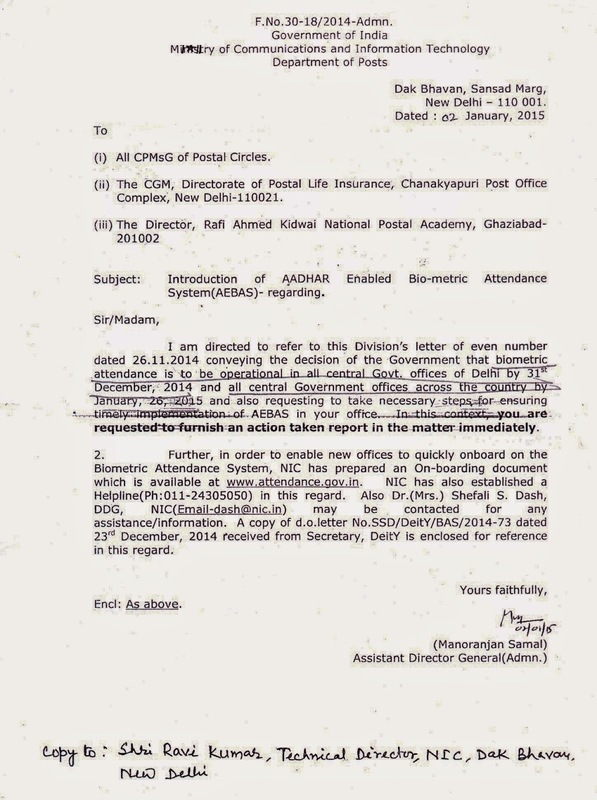 Sub: Formation of AIPRPA in all States and Districts – Certain inhibitions and hesitations in some areas – regarding. You may kindly remember that the AIPRPA (All India Postal & RMS Pensioners Association) was founded in the 1stfoundation AIC at Vellore (Tamilnadu) in which several leaders including yourself had participated. The AIPRPA was formed as per the decision of the unanimous resolution adopted in the 9th Federal Council of NFPE held at Hyderabad in the month of June, 2013. 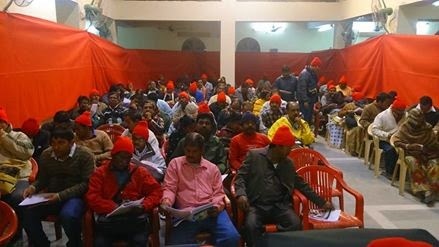 As we proceed to constitute State and District level organisations, we are facing a situation in one or two states like Assam and West Bengal where the Postal Pensioners are feeling that this formation of AIPRPA may weaken the united pensioner's movement being built by NCCPA under your leadership. There is also a feeling that formation of a monolithic Pensioners' organisation for the Postal Pensioners is a step towards weakening the composite CGPA Organisations. I have seen your reply letter to a similar question from the Secretary General of National Federation of Civil Accounts Employees. I therefore request you kindly to clarify as to how the NCCPA look the step being taken by us to establish AIPRPA as a monolithic postal pensioners' organisation? As we are proceeding to sit in our All India Managing Committee soon, your enlightenment will help us in our endeavour to build our organisation. Thanks for your letter dated 31.12.2014. As I was out of Delhi, there is a certain delay in reply for which I may kindly be excused. NCCPA is not at all opposed to the idea of a monotithic Pensioners Organisation of Postal Pensioners. we have seen that formation of Central Government (Composite) Pensioners Associations have not been able to motivate all pensioners to join them. If postal pensioner has initiated to form CGPA, the majority of those who have joined it, are Postal Pensioners and only a few Pensioners from other Departments have joined it. If on the other hand an Audit & Accounts Pensioner has initiated to form Pensioners Association, the majority who have joined it are Audit & Accounts Pensioners with few from other Departments. Whereas Postal Pensioners Associations / Railway Pensioners Associations / Central Excise & Customs Pensioners Associations whereever formed have obtained membership from most of the pensioners from respective Departments. On the basis of these ground realities, NCCPA totally favours Pensioners Associations of respective Departments which can federate into a National level Pensioners Associations of respective Departments and these federations can affiliate with NCCPA while their Circle / State level bodies may affiliate with the State /Circle Committees of NCCPA. This is the pattern which is obtaining in Confederation of CGEs & Workers as well. The CGP as already in existence would obviously be reluctant for such a reorganisation of Pensioners Associations as they would take this move as poaching away some of their members. If we explain that since these Departments wise Pensioners Associations will affiliate at the National level with NCCPA and at State / Circle level with state committees, the composite character would be restored with wider unity amongst the Pensioners, I hope this will satisfy them. 2015 FEBRUARY 17th, TUESDAY, at new delhi. It is hereby notified that the extended National Secretariat meeting of the Confederation of Central Govt. Employees & Workers will be held at Confederation Headquarters (1st Floor, North Avenue Post Office building) New Delhi-110 001 on 17th February, 2015, Tuesday. The meeting shall commence at 10.30 AM on 17-02-2015 and continue till close. All National Secretariat members (CHQ Office Bearers) and State C-O-C General Secretaries are requested to attend the meeting without fail. The following shall be the agenda of the meeting. a) Review of the 11th December National Convention. b) Implementation of the decisions of NJCA dated 11-12-2014 & 11-01-2015.
c) Fixing of quota to all affiliates of Confederation and COCs for participation in the 28th April 2015 Parliament March of Central Govt. Employees. 4. Financial Review and remittance of arrears of quota by affiliates. 5. All India Workshop of Women Employees of Confederation - Fixing venue and dates. 18th all India Confere3nce of BSIEA was held on 8th & 9th January, 2015 at Jodhpur, Rajasthan. Around 109 delegates participated in delegate session out of them 19 female and 90 male delegates. Open session was on 8th January. Com. Vyasji addressed before the audience as Chairman of the Reception Committee, Com. Tapan Sen MP and Gen. Secretary, CITU delivered his speech as Inaugurator, Com. K. K. N. Kutty addressed to the audience as Special Guest. Around 21 representatives from different offices including Railways, Postal, Income Tax, Arid forest Research Institute, ZSI, Doordarshan, Arid Forest Research Institute and many more participated as invitee and assured for active support for any movement called by Confederation. Com. Pijush Roy inaugurated Delegate session. Com. 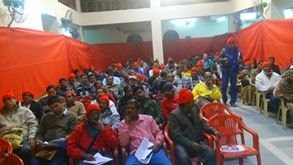 S. K. Vyas addressed the delegates and discussed about 15 point charter of demands of Confederation. Com. Vrigu Bhattacharjee delivered his speech as special guest of Delegate session. 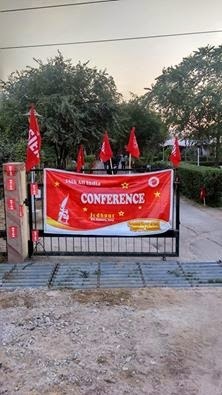 The Conference successfully ended on 9th January. & Org. Secretary Confederation of Central Govt. Declaration of Assets and Liabilities under the Lokpal and Lokayuktas Act, 2013 - Clarification on filing of property returns in accordance with existing service rules for different categories of public servants – Reg Click Here. Com. K. K. N. Kutty, President, Confederation, Com. S. K. Vyas, (Chairman, Reception Committee), Com. Vrigu Bhattacharjee (Secretary General, Civil Accounts Employees Association), Com. Pijush Roy (General Secretary, CCGEW, West Bengal) & Com. Arup Chatteerjee (Secretary General, BSIEA) attended.